There are many ways to assess talent, potential or performance of employees and/or candidates. Especially corporate companies use assessment centers at different stages of the employee life cycle. Talent assessments are often used during the recruitment process in order to determine the match with the position to be filled as well as the potential in general for the company and other positions to come in the future. Potential assessments are used by talent management departments in order to find the stars of the future among the current workforce and to be able to support these employees with broad potential with advanced training, coaching and incentives. And then there are performance assessments that are pretty much done every year in order to determine the value of the work done by the employee and his/her future career path. Apart from the latter, many of these assessments are done by independent third parties that support companies by deploying experienced psychologists acting as an independent observant and assessor. These people know the company only as an external, but are asked to make the right decisions for the employees and the corporation. They are certainly not the only decision makers in the process, but often enough their verdict is put above internal opinions formed earlier. This mainly happens in cases where the hiring manager or superior has doubts or doesn’t trust his/her own gut feeling. But there is one other version of assessment centers that we see more and more during the last few years. It’s the group or team assessment. With this assessment the focus isn’t only put on the individual, but also on the collaboration of the individuals within a group or team. How do they work, communicate, co-operate with each other? Where are the potential areas of conflict? Which are the strong alliances? The reason that these assessments are used more often these days is an effect of what we see from the hiring strategy many corporate organizations apply for several years already: High potentials only! The definition of a high potential candidate can be very different from company to company but is mostly pretty similar within an organization. This means that a group of high potentials is very likely to be consisting of people with very similar talents, interests, behavior, etc. Synergies can barely be developed. People are rather competing with each other than collaborating. So another way of making a team function needs to be found. This often starts with an assessment. But what, if you didn’t need a third party for that? What, if you as a team lead are able to do it yourself? What, if the team will have fun while doing it? Sounds good? It can be so easy! 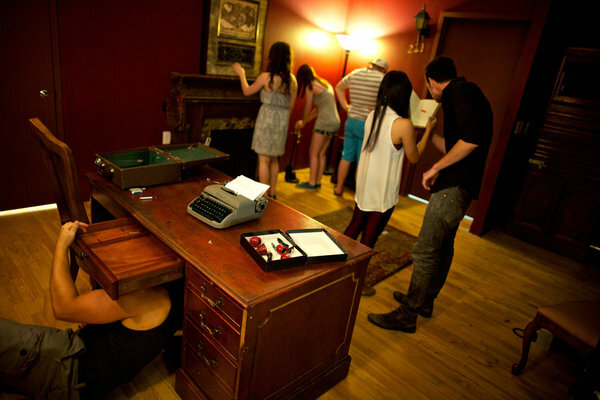 Think of taking your team to an escape room! What is the advantage of it? You can pretty much see everything that you would experience in a group assessment as well. You can observe your team while resolving tasks: Who is taking the lead? Who has the brightest ideas? Who combines the outcome and leads it to the final result? Who is going into the nitty-gritty details? Who is leaning back watching the effort of the group? Who is at the group’s service? Who is working closely together with one or more colleagues? Who is arguing with whom? Who has the biggest ego? And so on… By observing you will find out who is good at what kind of tasks and who works well together. You might find out, that some people are talented and interested in very different areas than the ones they have to cover in daily working life executing their jobs. Maybe you even realize that you made two people team up for a task or a project that simply don’t work together very well.